Everything about the French life and culture inspires my cooking daily. Because of the French, we now understand and love food in America the way the French have for years. Thanks to the likes of food-obsessed Americans such as Julia Child, M.F.K. Fischer, and James Beard who lived in France and brought French food culture to the US, we now have a country full of "foodies." Every self-proclaimed foodie must spend time in France. It's completely necessary to even get the slightest glimpse of what food is really all about. This recipe comes inspired by mine and Tres' trip to The champagne region of France last year. There's nothing quite like "champagne country" because guess what?! There's only ONE!!! If you've ever wondered why champagne is so rare and so expensive, it's because champagne is only made in one place: France. You see, champagne can only be made here because the terrain, soil, and climate are absolutely perfect to get the distinct flavor and consistency that is champagne. It's pretty spectacular when you think about it. As special and fancy as champagne may be, throwing $70+ dollars into a Saturday afternoon cocktail is not always my style. Actually, it's never my style. I would prefer that amount of money to be drank solo... No need to mix it up and wash it down with simple syrup. So, in this case, I cheated a little bit. You don't need champagne for this drink. A sparkling wine, Cava, or Prosecco rose will do just the trick! Rose Lillet, a French aperitif, is added for a zip and sweetness, and something about the fresh honey and berries give this drink a very "French countryside" feel. I want to be in Provence looking at Lavender fields when I drink this. Make the berry-honey syrup. In a saucepan, bring the honey, water, and 1/4 cup each of the strawberries, cherries, and raspberries to a boil. Slightly mash the berries in the syrup and set aside to cool. 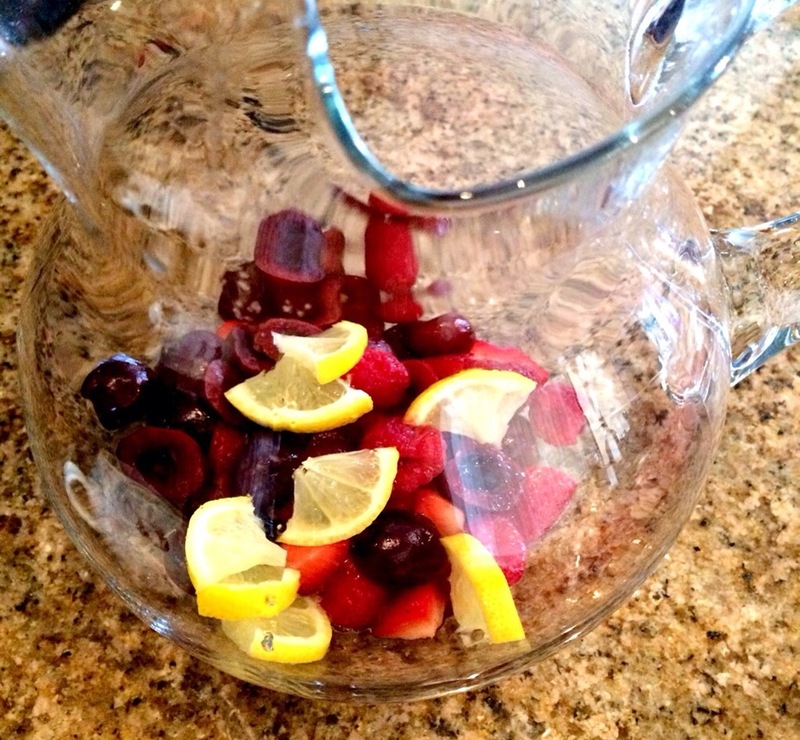 Add the remainder of the berries to a pitcher. Slice a lemon in half. Juice one half into the pitcher and slice the other half into small pieces and add with the berries. Strain the berry-honey syrup into the pitcher and discard the mashed berries. Add the Lillet and the bottle of sparkling rose into the pitcher. Stir and serve!